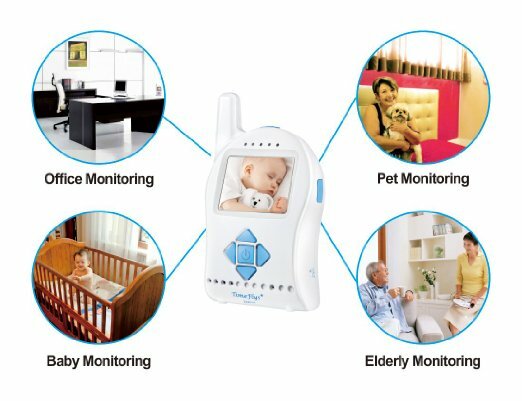 The Timeflys baby video monitor is wireless and is meant to be used in the home to keep an eye on your little one. 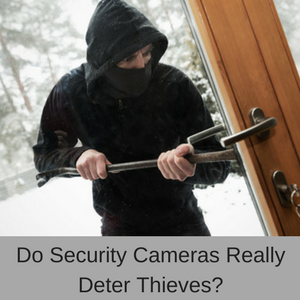 You have a camera that you place in the nursery and a handheld parent unit with a video monitor screen that displays a live video of your baby or toddler. 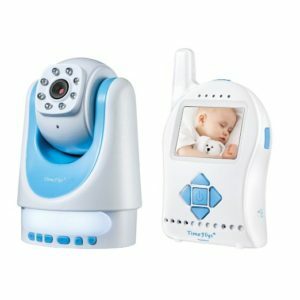 This is a user-friendly baby monitor with 2 way communication, pan and tilt, a zoom, IR night time vision and an ambient temperature sensor. You also have a 12 hour battery life on the parent’s unit in standby mode and a very large 1000 ft operating range. 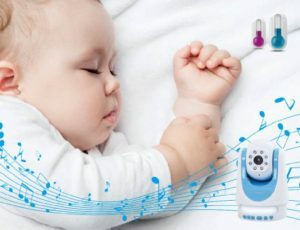 One of the great features of this baby monitor, that many of the others don’t have, is that you can upload your own lullabies, songs or messages to the unit. 12 battery life on standby. 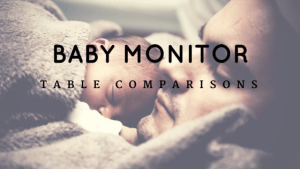 The 2 way communication feature with adjustable volume is a necessity on any good baby monitor, because it lets you talk to your little on when they wake up or are unsettled, but you are in another room. 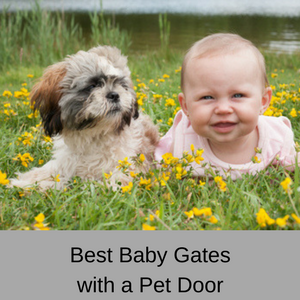 You can also talk to your partner if they are in the nursery and you are over the other side of the house. 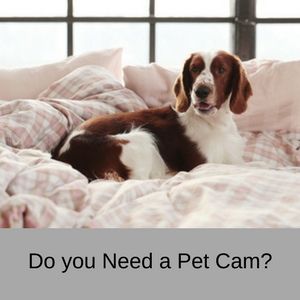 The pan and tilt on the camera has a wide 350 degree horizontal range and a 120 degree vertical range, which lets you follow your partner around the room as they end to your baby or watch your little one scamper across the room themselves. Not all baby monitors have a pan and tilt feature and they don’t all have a zoom feature. 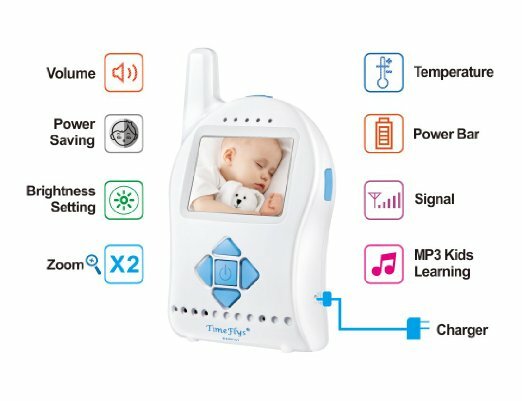 The Timeflys baby monitor has all of these features and the x 2 zoom lets you move in for a closer look when your baby is sleeping or is unsettled. 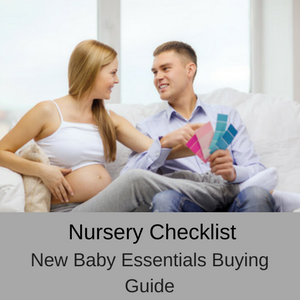 Checking the ambient temperature in the nursery is not a feature that all parent’s find useful, but it is there if you need it. You can set a minimum and maximum range and the handheld parent unit will alert you if the temperature goes outside of this range. The temperature can be set in Celsius or Fahrenheit. The Timeflys baby video monitor has an automatic IR night time function of 15ft that turns on when the camera detects low light levels. 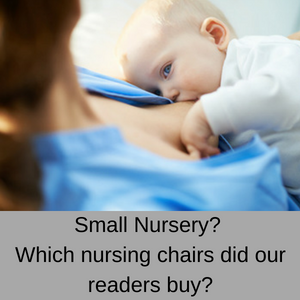 This means that you don’t need to turn the light on in the nursery to see your baby as the camera gives you crystal clear vision, regardless of whether it is day or night. There is also a brightness setting that you can alter to suit your own preferences, on the parents unit. The MP3 lullaby and story player is a great additional feature on this baby monitor, because you can load your own lullabies, stories or songs onto an SD card and remotely play any of them from anywhere in your home. You can also connect the parent’s unit to your computer using the USB cable and upload songs or lullabies directly. When you set the parent’s unit to standby mode you have up to 12 hours battery life before it needs to be recharged. Using the VOX feature you can set the monitor to shut down when it hasn’t sensed sound after 50 seconds (which saves the battery) and it will come back on automatically when your little one cries or makes a noise. When the battery in the handheld unit is becoming low, the unit will give a notification alert, so you can plug it in to recharge. 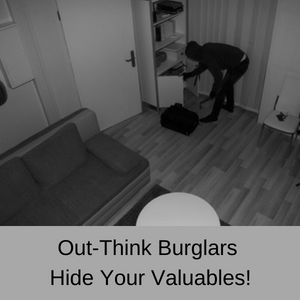 With a large 1000ft operating range, you can be just about anywhere in your home and still be within range of the camera. If you go outside of this 1000ft range, the parent’s unit will alert you so you can move closer. Battery: Screen monitor – 1 Ni-MH battery with up to a 12 hour life in standby mode. Two-way communication: Yes, you can talk to your baby and soothe them anywhere within the 1000ft operating range. Infrared: 15ft night vision range. Pan and Tilt: Yes, 350 degrees H and 120 degrees V.
Data encryption: I can’t find any information on data encryption for this baby monitor. Range: Maximum signal range 1000ft range. Lullabies: Yes – Pre-installed and upload your own. Monitor resolution: VGA (320 x 480). Viewing angle: 350 degrees horizontal and 120 degrees vertical. Color images: Yes during the daytime, black and grey during the night. 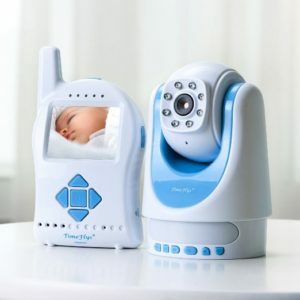 There are not a lot of customer reviews online so far for the Timeflys baby video monitor, but those that do exist are rather mixed. For example, customers like the pan and tilt feature and being able to upload your own lullabies to the unit. On the other hand, some customers complain about the quality of the videos and that their monitors stopped working properly or recharging after only a few months. The picture quality is not mind-blowing, but it works very well for the price. The battery life on the handheld unit seems to be outstanding for our use. With the screen on, it would last most of the night, but we usually plug it in overnight. Well constructed, easy to use – works well. Picture looks good and screen size is perfect. Picture kicks on and off with baby cry to save battery. You can control music from parent side, but not night light or volume. Temp display seems accurate. No signal problems. Other than not having a large screen (which would reduce the portability), this is the best baby monitor on amazon. It was super easy to set up. So far, the range is good for us, and we can hear and see our baby clearly when we were in the kitchen downstairs. 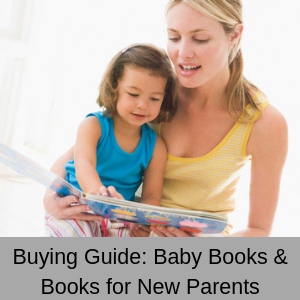 At first blush, this is a great baby monitor with lots of great features. it has 2 way communication, pan and tilt, a zoom, large operating range and you can upload your own lullabies. At the moment however, there are not enough online reviews from customers to get a clear picture of this baby monitor, because too many have had problems with it. 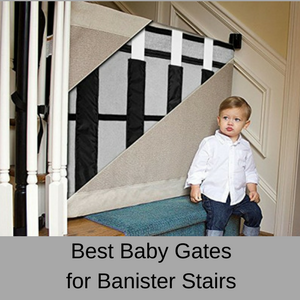 To read more of my baby monitor reviews, click here.